CORVALLIS, Ore. – Chemists at Oregon State University have discovered that one or more organic compounds in a family that traditionally has been known as pollutants could offer an important advance to make cheap, reliable batteries. Such batteries might be of particular value to store electricity from some clean energy systems. The inability to easily and cheaply store energy from the wind and sun, which is highly variable and intermittent, has been a key constraint to wider use of those forms of energy. Although pumped hydro systems or compressed air facilities comprise almost all of the alternative energy storage capacity of this type, they have limitations. There is a tremendous demand, scientists say, for energy storage solutions that are modular and particularly suited to community storage, "smart grid" and micro-grid uses. A new advance, published in ACS Energy Letters, has shown that at least one, and probably more compounds known as polycyclic aromatic hydrocarbons, or PAHs, can function as a potentially low-cost, long-lasting and high-performance cathode in "dual-ion" batteries. Such batteries would contain a carbon electrode as the anode and solid PAH as the cathode, with no need for the rare or costly metal elements now usually used. Traditionally thought of as pollutants, PAHs are usually products of combustion – anything from a campfire to an automobile exhaust or coal-burning power plant — and pose significant concerns as toxins and carcinogens, often when inhaled. But in this study, scientists found that at least one PAH compound called coronene, in a safe, crystallized solid form, makes a high-functioning electrode material with promising characteristics in dual-ion batteries. "Prior to this work, PAHs were not considered stable when storing large anions," said Xiulei (David) Ji, an assistant professor of chemistry in the OSU College of Science, and recipient of a 2016 National Science Foundation CAREER Award, the most prestigious award for junior faculty. "We found that coronene crystalline solid, a PAH, can lose electrons and provide a good capacity of anion storage while being structurally and chemically stable. Coronene had good performance as an electrode and the ability to have a very long cycle life, or the number of charges and discharges it can handle." Avoiding the use of metals in the electrodes is a huge advantage for dual-ion batteries and makes them much more sustainable, Ji said. 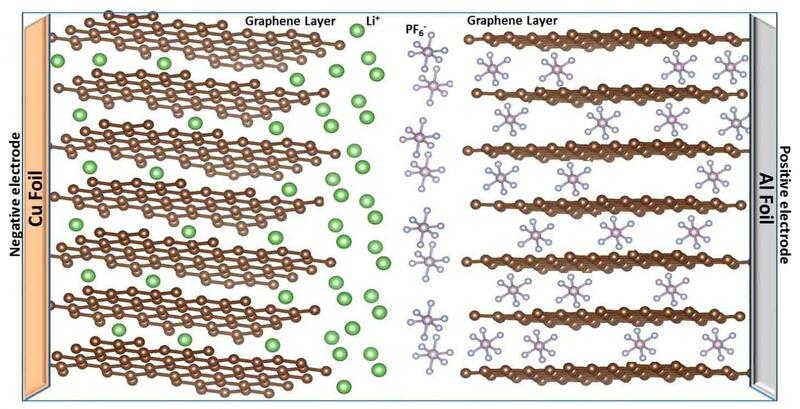 Graphite cathodes can do this, but a serious challenge that has held them back for two decades is that they operate at levels hostile to the non-aqueous solvents in the electrolyte. The batteries based on coronene largely eliminate this problem, and would significantly improve the maintenance cost and sustainability of a stationary battery system. The researchers in this study demonstrated the potential of coronene, but also said that other PAH compounds as well may have similar potential. This research opens the door to an entirely new concept in battery construction, they said, which might take what had once been an unwanted pollutant and turn it into a safe, valued product. Primary collaborators on this project in OSU's Department of Chemistry included lead author and graduate student Ismael Rodriguez-Perez, and professors Michael Lerner and Rich Carter. The research was supported by the American Chemical Society Petroleum Research Fund.